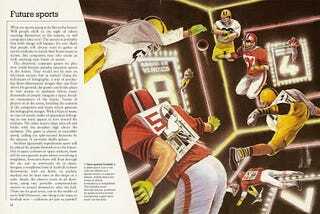 This illustration of "zero-gravity football" appears in the 1981 book School, Work and Play (World of Tomorrow). Zero-gravity football is a great sport, but it can only be played in a space colony or a space station, where there are zones in which everything is weightless. The players zoom through the air, powered by small motors in their backpacks. Laser lines mark out the field.